Infor, a leading provider of industry-specific cloud applications, recently announced the availability of Infor EzRMS Mobile as part of the company's overall portfolio of Hospitality Revenue Management Solutions. The application, available through Google Play™ Store and Apple App Store, enables users to stay on top of their business by providing critical information on mobile devices. It provides the right information at the right time so hoteliers can analyze trends and make pricing decisions on the go. "As a long-time Infor customer and partner, we were excited to get the chance to work with the new Infor EzRMS Mobile App," said Cynthia Paynter, Director Revenue Management and Pricing Solutions, Accor. "In order to exceed guest expectations, hoteliers in today's competitive hospitality industry need to have every possible advantage on their side. Having a mobile app such as this enables more real-time collaboration, as well as more efficient and effective employees." 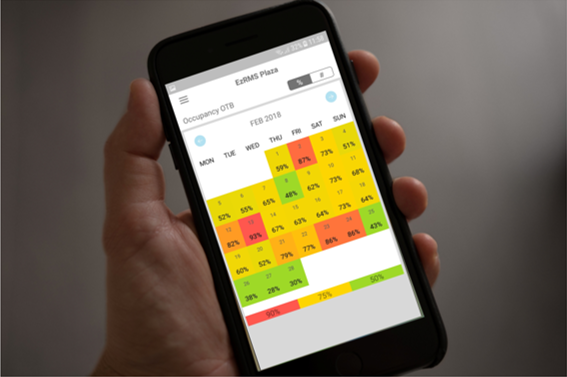 Smart KPIs - The mobile app enables more informed and confident decision making by providing a view of the most important business metrics through comparisons of past performance and future forecasts. The KPIs are presented in figures and charts for quick and easy access to data related to Occupancy, Room ADR, Room Revenue and more. Customizable Views and Dashboards - Infor EzRMS Mobile allows the end user to configure and customize how they view information and data, based on what works for them. Data can be sorted by Pick-Up Information, Day, Month, Calendar View, Actuals, On-The-Books, Forecasts and more. The app makes it possible for users to access all relevant information and easily swap from one hotel to another, if necessary. Updated Recommendations - With easy integration to property management systems and central reservation systems, all information is kept up-to-date and users can view relevant recommendations and related competitor analysis to make informed pricing decisions. Users are also able to upload these recommendations to third party systems. Instant Notifications - The application provides updates and notifications for changes that may have an impact on the business, and the data is accessible on mobile devices. "We have been working to develop Infor EzRMS Mobile with the expectation that will empower the decision making of those in the hospitality industry and arm them with innovative technology solutions to improve their businesses and increase profitability," said Stan van Roij, Vice President of Hospitality Solutions and Program Management, Infor. "Having the power and forecasting capabilities in a mobile form is paramount for revenue managers who need the relevant data at their fingertips to successfully do their job."